This study analyzes the efficiency of household-level energy consumption using a rich microdata set of homes within the United States. We measure efficiency by extending a cost-minimization model that treats the total amount of energy services produced as latent or unobserved due to technological differences in household consumption. The empirical strategy consists of applying latent class modeling to cost frontier analysis, which helps to identify heterogeneous subsets of units that require the fewest energy resources. Our estimates of efficient units form an empirical cost frontier of best practices within each subset. In order to understand the determinants of household-level energy efficiency, we condition the cost frontier analysis on numerous physical, climate-related, and socio-economic characteristics of the household. We find that state-level energy building code regulations, on average, induce a one-to-four percent marginal increase in household energy consumption. This paper discusses a Bayesian approach to analyzing cost efficiency of Distribution System Operators when model specification and variable selection are difficult to determine. Bayesian model selection and inference pooling techniques are adopted in a stochastic frontier analysis to mitigate the problem of model uncertainty. Adequacy of a given specification is judged by its posterior probability, which makes the benchmarking process not only more transparent but also much more objective. The proposed methodology is applied to one of Polish Distribution System Operators. We find that variable selection plays an important role and models, which are the best at describing the data, are rather parsimonious. They rely on just a few variables determining the observed cost. However, these models also show relatively high average efficiency scores among analyzed objects. Many natural-resource-abundant countries have established petroleum funds as part of their strategy to manage their resource wealth. This paper examines reasons that such funds may be established, discusses how these funds are organized, and draws some policy lessons. The paper then develops a theory of how petroleum funds may affect the economic and political equilibrium of an economy, and how this depends on the initial institutions. A challenge with petroleum funds is that they may produce economic and political incentives that undermine their potential benefits. An alternative to establishing petroleum funds is to use revenues to invest domestically in sectors such as infrastructure, education, and health. Such investments have the potential to produce a better economic, as well as institutional, development. This is particularly the case if the initial institutions are weak. This paper uses a model with Directed Technical Change to theoretically analyse observable heterogeneous energy intensity developments. Based on the empirical evidence, we decompose changes in aggregate energy intensity into structural changes in the economy (structural effect) and within-sector energy efficiency improvements (efficiency effect). The relative importance of these effects is determined by energy price growth and sectoral productivities that drive the direction of technical change. When research is directed to the labour-intensive sector, the structural effect is the main driver of energy intensity dynamics. In contrast, the efficiency effect dominates energy intensity developments, when research is directed to energy-intensive industries. Increasing energy price generally leads to lower energy intensities and temporal energy price shocks might induce a permanent redirection of innovation activities. We calibrate the model to empirical data and simulate energy intensity developments across countries. The results of our very stylised model are largely consistent with empirical evidence. We examine characteristics associated with consumer (dis)engagement in the residential electricity market, a topic of increasing policy interest and intervention, introducing consumer attitudes and marketing recall as new factors. 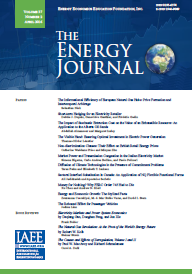 General attitudes are closely associated with electricity market activity, with considerable variation in the strength and statistical significance of these relationships, indicating very different motivations amongst consumers. Recall of direct marketing routes has little identifiable effect, while advice of family and friends is influential. We identify implications for communication by both suppliers and policy makers seeking to improve the functioning of such markets, including the necessity for a variety of approaches. Non-OECD Asian economies comprise about 34% of world primary energy demand, 60% of population and 65% of the world's poor, and will account for more than 60% of the total increase in energy consumption between 2015 and 2040. Energy sector reforms in non-OECD Asia are thus significant for global energy use, sustainability and socio-economic welfare. The region has experienced a slow and difficult reform path and after more than two decades of reform efforts it is time to take stock of their outcomes. Using a novel dataset assembled for this purpose for the period 1990-2013 for 17 non-OECD Asian countries, we apply instrumental variables regression techniques to several electricity sector reform outcome models. We find that the standard reform model has had limited benefits, largely due to sectoral heterogeneity and institutional endowments. We also show empirical evidence of the theoretical trade-offs between technical efficiency, economic and welfare objectives of reforms. The results call for rethinking of the effectiveness of reforms and awareness of the effects of key reform steps on different outcomes. This is useful for balancing the trade-offs among competing reform objectives. In the presence of transmission outages, uncertain demand and variable renewable supply, network operators keep a reliability margin to avoid interruptions and black-outs. The reliability margin is presently determined by the N-1 reliability criterion. Our analytical model defines the optimal reliability margin by balancing congestion costs and interruption costs. This leads to more efficient use of transmission capacity and to smaller investment needs than with the N-1 criterion. A numerical illustration shows the net benefits of the new reliability criterion. In this study, we seek to explore the impact of a state level transmission expansion project, the Competitive Renewable Energy Zones (CREZ), whose goal is to integrate a massive amount of wind energy, on the wholesale market prices in the Electric Reliability Council of Texas (ERCOT). We find strong evidence for price convergence across ERCOT with accordance to the timing of the expansion of major sections of the CREZ. A variety of empirical analyses shows a gradual transition to a well-integrated market. We also find that regional-specific shocks became more important in terms of driving price change in other regions. Specifically, the impacts of Houston (demand) and the West (wind supply) on each other and the North and South regions have increased significantly. Our study contributes to the literature by connecting the expansion of physical transmission lines with electricity market integration.